In this compelling, and important book, John Schmitz brings order to the world of chaos that surrounds us. 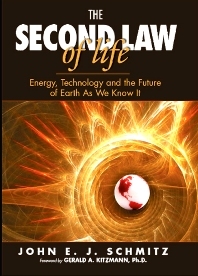 The Second Law of Life refers to the second law of thermodynamics, entropy, which is an omnipresent force that quietly and crucially determines every aspect of our society, culture and daily lives. Unless we come to understand entropy, future generations will face consequences of the unstoppable laws of physics. Entropy explains the amount of energy no longer capable of doing work; in other words, wasted energy or heat loss. Each moment of every day, we lose irreplaceable energy and ômodernö technology is not helping. In fact, it is accelerating the problem at a catastrophic rate. û And we will ultimately face a heat death crisis and utter destruction of the Earth. Even actions we take to improve the environment may actually do more damage than good. For example, recycling is considered environmentally, socially and politically correct. Under the influence of entropy, however, it is a prolific waster of energy; we must look at entire systems, not just parts. It is critical that we find ways to reduce energy loss. Seeing the problems with greater clarity will lead to solutions. This fascinating and accessible journey through the second law of thermodynamics is a step in the right direction. General science readers interested in the principles of physics and how they affect daily life. Readers interested in energy and environmental issues and possible solutions to current crises. Students in first year introductory courses on thermodynamics. So what is all this talk about entropy?